I taught concealed carry classes for almost 10 years and saw lots of newbies have problems they could have avoided if they had only known more before buying a gun. For a variety of reasons, these problems seemed to affect women, especially. The following five things can help new shooters — guys or gals — make better choices when buying their first handguns. 1. Don’t Choose — Yet Many times, students who had never fired a handgun came to my class and proudly showed me their “very first gun.” One woman arrived late to class because she stopped by a shop a few miles out of the way to buy her first pistol. Other students with new guns arrived at class having last pulled a trigger back on Grandpa’s farm sometime just after Lewis and Clark passed through, headed west. If it’s been decades since your last range session, consider yourself a rookie. You need some experience to begin to know which handgun might work for you. Do not run out and buy a handgun until you get some experience, first. How do you get shooting experience without a gun? Sounds like a classic Catch-22. But there is an answer. Seek professional advice and training before you buy your first handgun. Get some “trigger time” with many different models and calibers before you make your buying decision. 2. Hire An Instructor Pay a professional for shooting lessons before you buy your first gun. A good instructor will give you shooting experience, increased confidence and some basic skills and knowledge. Do you know the differences between single -action, double-action, double-action only, and double-action/single-action? If not, take a lesson from a professional instructor who will teach you all that and more. And, watch our videos on YouTube for lots of tips and tricks for novice shooters. The videos won’t replace training from a pro, but may help to answer some of your questions. During the first contact, tell the instructor you don’t have a gun yet, and want to know more before buying one. Instructors typically own a lot of guns, and are happy to let you shoot them, especially if you show up with ammo. I often tell new shooters to bring four or five different calibers of ammo so they could get a feel for which guns might work best for them. 3. Who’s A Teacher? If your significant other is into handguns, that’s great! Just don’t ask him or her to teach you to shoot. Learning to safely operate a handgun for the first time is challenging enough without the added pressure of being watched — and corrected — by your romantic partner, unless you have a very special relationship! Pay somebody else for your first shooting lesson. It’s worth it. Full-sized handguns are heavy, but are also often easier to manipulate and usually help soften recoil. They make great first guns for anyone who is inexperienced, especially many women. Most small guns are, in actuality, “expert’s” guns and take a good deal of training to master. 4. Only You Can Decide Women often come to classes with a gun picked out for them by a man — and it’s almost always wrong. The best handgun for you is a very personal choice. Only you can make that choice, once you have some knowledge and experience. Men buy themselves the gun they want, but get the woman a much cheaper gun. I recall a particular couple. All day, he bragged about two things: the fact he spent only $90 on a pawn shop .25 ACP for her, and his brand new Kimber Custom .45. I sometimes wonder how long that marriage lasted. Women buy the gun somebody they know carries. One woman, who had never fired a gun, arrived with a brand new Glock 27 — a subcompact in a caliber known for snappy recoil — because a deputy sheriff friend told her he always carried one off-duty. Even though she practiced her grip and dry fired, when the first (and only) round went bang, she screamed and dropped the Glock in the dirt. She had to take NRA Basic Pistol before I would sign the training affidavit for her carry permit. 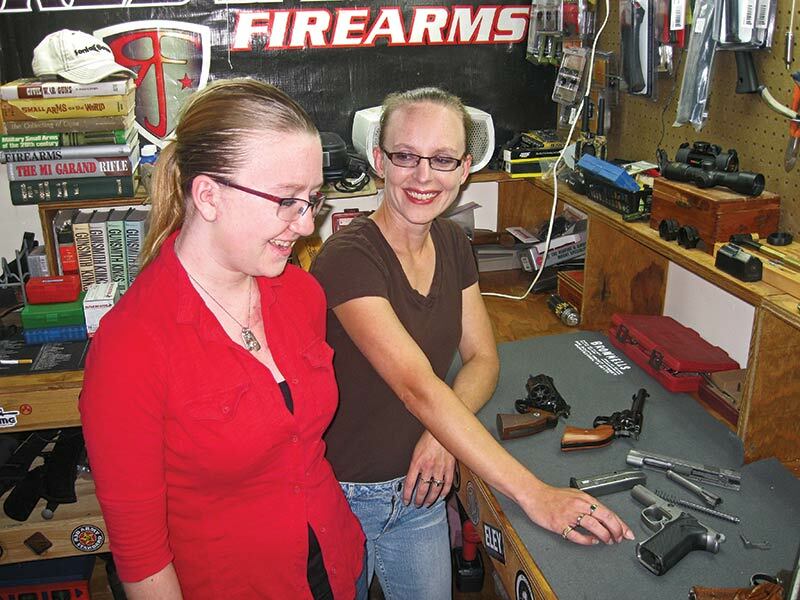 She passed with flying colors, and found several other handguns she was more comfortable with. New shooters sometimes buy whatever the gun store guy tells them to buy. Gun stores are in the business of selling guns. The gun store guy is usually going to try very hard to sell you whatever he has in stock. It’s his job, literally. The gun might be great for you. Then again, maybe it might not be. Sometimes you get lucky and a gun store will do their best to honestly equipment you with what you want, and what’s best for you. Make sure you reward them by being a return customer. Getting “hands-on” under the guidance of a teacher will help you have a better understanding of your own needs and expectations — before you put your hard-earned cash down! 5. Be Willing To Go Big Lots of times, men recommend women buy small handguns. It sort of seems to make sense. Women are generally more petite than us hairy, knuckle-dragging men. Smaller person, smaller gun, right? Not always. Small guns are often harder to handle and shoot than full-sized guns. The classic bad gun advice for a new woman shooter is to buy a tiny .32 or .380 ACP, or a little-bitty lightweight .38 snubbie. Such guns are easy to carry, but can be downright unpleasant to shoot repeatedly. Full-sized guns are bigger and heavier, but the extra mass soaks up recoil. My wife’s favorite pistol is a full-sized .45 ACP Springfield 1911. She loves to shoot it, but hates to shoot my .45 ACP Kimber Ultra Carry II 1911. Both are 1911’s in .45, so what’s the difference? The big Springfield has a steel frame, and the smaller Kimber has an aluminum frame. The smaller, lighter gun has sharper recoil than the bigger, heavier gun in the same caliber. So, get some professional training and experience before you buy, and insist on choosing the handgun that works for you. Arm yourself with plenty of knowledge, the advice of trusted friends, check out those videos I mentioned and if you have any questions, drop us a note at [email protected] and we’ll do our best to help you out.